At InfoComm 2016, Sennheiser showed enhancements to its new SpeechLine Digital Wireless system — the first digital wireless microphone to be designed exclusively for speech applications. The new wireless system is an extension of Sennheiser’s AVX system designed for ENG use. 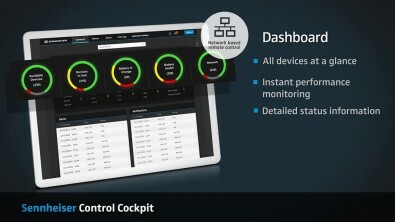 Sennheiser said the new system offers an expanded range of capabilities enabling simultaneous, multi-room implementations of multiple SpeechLine systems, along with Dante support for IP network compatibility and effortless management via the new Sennheiser Control Cockpit software. “Our aim was to develop the first microphone to be optimally designed for the spoken word,” said Kai Tossing, portfolio manager for business communications at Sennheiser. Sennheiser found the most important requirements placed on microphones for speech applications are easy installation and operation, a high level of reliability and future-proof technology. As a result, installation, operation and adjustment with the SpeechLine system are easier than those of any other microphone. Once the microphone has been configured, users do not require any technical audio ability. SpeechLine Digital Wireless has a frequency management feature that automatically searches for free frequencies on-site —eliminating the need for time-consuming frequency planning in advance. In order to ensure stable and constant high-quality wireless transmission, Sennheiser attached great importance to reliability. If the wireless transmission is disturbed, Automatic Interference Management automatically and seamlessly switches the system to an alternative free frequency. The lithium-ion battery technology used in SpeechLine Digital Wireless provides a battery life of more than 15 hours. In addition to various flexible charging possibilities, the battery can also be recharged via USB if required. Optimum speech intelligibility is guaranteed at all times by various selectable sound profiles and sound processing algorithms, such as presets for bass-intensive male voices or high female voices. The system has advanced 256-bit AES encryption, allowing users to have maximum security at all times. The system operates in the license-free, future-proof 1.9 GHz frequency band. No registration is required. A key new feature at InfoComm is the new multi-room functionality, which allows simultaneous, interference-free use of multiple systems on the license-free 1.9GHz frequency. Users are able to adjust the transmission power to address different scales of installations in multi-room scenarios – addressing a common problem found in many venues, where several systems need to be used in close proximity. A further enhancement is the new Sennheiser Control Cockpit, an app for smartphones or tablets that makes status monitoring and managing SpeechLine systems effortless. Also joining the SpeechLine family for the first time, is support for Audinate’s Dante Network Protocol to enable use with audio-over-IP networks.